PT. Baruna Raya Logistics along with the affiliation companies, PT. Baruna Balikpapan Sejahtera and PT. Wasesa Line took part in condolences over tragedy of Earthquake and tsunami that hit Palu and Donggala, Central Sulawesi. 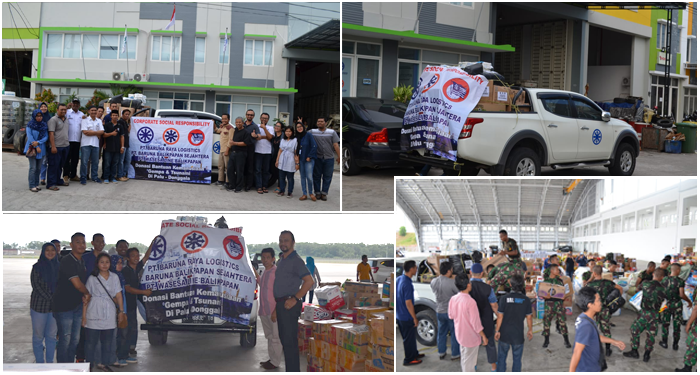 The Companies managed to help the casualties of calamities by raising funds from their employees on October 1st-5th, 2018 . The amount of funds collected was used in the form of humanity relief aids such as blankets, towels, veils, food, infant formula, hygiene kits, medications and other disaster recovery supplies. The aids were handed over by the company representatives, coordinated by branch manager of PT. Baruna Raya Logistics, Mr. Suhirman Hudi Wiyandono. 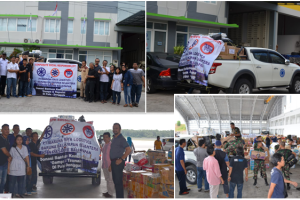 The whole facilitate-aid delivering process took place at Sultan Aji Muhammad Sulaiman Sepinggan Airport Balikpapan (Hanggar D). The cargo was unloaded by team of TNI AU in order to prepare for distributing to the casualties in the field. October 2nd is declared as The National Batik Day. Being recognized by UNESCO as “Indonesian’s Masterpieces of The Oral and Intangible Heritage of Humanity’, Indonesian batik was acclaimed as international cultural heritage. BALIKPAPAN — PT Pertamina Hulu Mahakam (PHM) sebagai operator Wilayah Kerja Mahakam yang didukung SKK Migas mengirimkan Tim Reaksi Cepat ke daerah bencana gempa dan tsunami Kota Palu dan Donggala, Provinsi Sulawesi Tengah pada Selasa, (2/10/2018).